I'm familiar with TSL. Good stuff! Thanks for the posting! I used to have Buick Men on cassette and it vanished somewhere over time. About 7 years ago I went to Ebay as you mentioned to get the CD and got outbid around $50. I am not a collector, so $50 was more than enough for the music. The best I could get was the Happiness promo, which is nice, but not as nice as the entire CD. I would have to repectfully disagree about their rerecordings being better. While the sound and editing is perhaps better on a technical level, I almost always prefer the original recording of any band. It's hard to describe, but the music just sounds more raw and passionate to me. I personally believe that it's because they were still regular guys trying to make it, rather than having a big record deal. An example of this is the Nixons local album Halo which they rerecorded most of into Foma. To me the renditions of Sister and Wire don't sound nearly as passionate. lets see i have probably one of the only copies of hagfishes first demo tapes made before george and tony were in the band plus some practices.my best friend james newhouse was there first singer who died in a car wreck in oct. of 94!!!! thought about putting copies up on ebay if anyone interested and not for no 50 bucks either. I've got a copy of Buick Men up on eBay right now and it's at $102.50. CRAZY!!! Anyone ever notice what "Buickmen" really spells out? 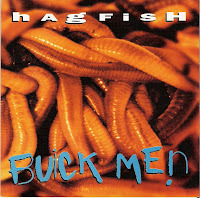 Just discovered Hagfish today and this stuff is so great. Loving the Allness of it. Can you please re-upload? Thanks in advance! Your blog rules!